The new Autumn/Winter catalogue will be launched in a couple of weeks' time. I still have a big pile of the Spring/Summer edition, so today I start to distribute them in my neighbourhood with my contact details stamped on the back, and hopefully I will drum up some local parties. First I leave a small pile of catalogues in a rack by the mailboxes at Metro Central Heights, a huge residential block down the road. Then I take half a dozen more to Borough Market, a real foodie hang-out which is only a 15 minute walk from my house. 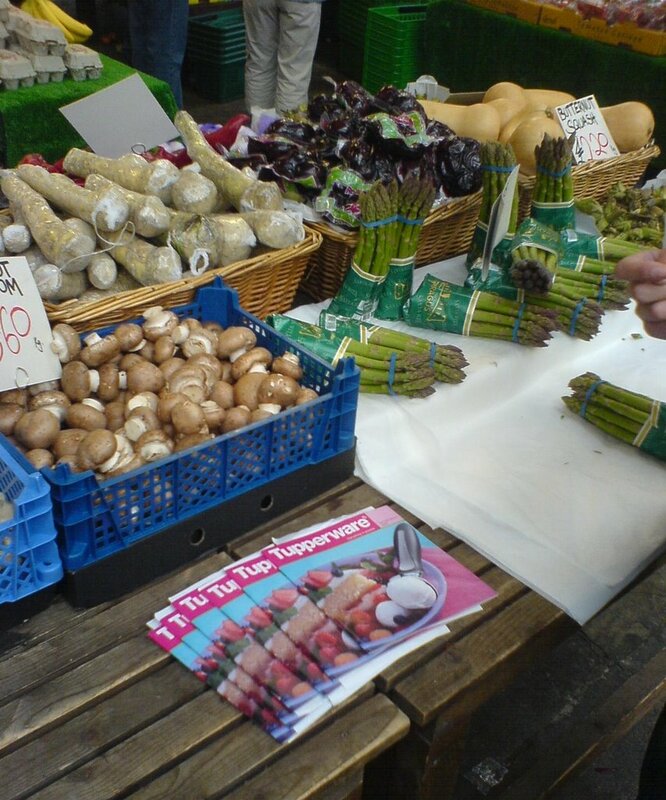 I was just going to just leave them on a random bench, but while shopping I spy a perfect spot on this vegetable stall and arrange the catalogues between the mushrooms and the asparagus. I check at the Paul Smith shop at Borough Market. As I wrote a few posts ago, they are selling Tupperware Mini-Maxes for an eye-watering £12 each. I have now sent two friendly emails to the buyer at Paul Smith, offering to run a party if they want one, but they haven't replied. I don't quite have the brass neck to leave some catalogues in the shop, but it occurs to me that Tupperware Head Office would not be happy that they are selling Tupperware in their shop at all, let alone at such a mark-up. I might just have to tip them off.